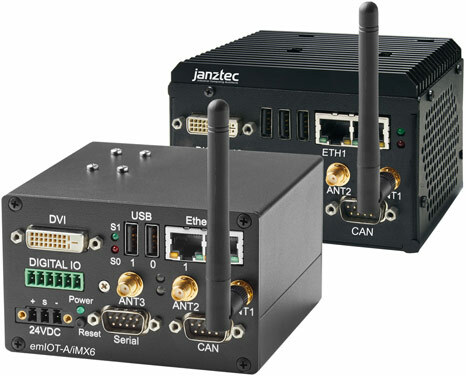 Janz Tec (Germany) has launched the emIOT-A/iMX6 and the emIOT-X edge computers. They are certified by SAP. The introduced certified hardware and software solution from Janz Tec and SAP thus enables the user to get a head start to an SAP IoT project. With the SAP cloud platform IoT service you receive access to IoT sensor data, which you can then augment with additional information from your company via the SAP Cloud Platform. This merged data makes it possible for you to carry out numerous optimizations to your business processes and create shorter reaction times for procedures critical to business processes. The SAP Cloud Platform provides a Platform as a Service (PaaS) model that allows rapid development of intuitive applications as well as making them available to end users, without the need to invest in a new and own infrastructure. The edge computers were tested in collaboration with the SAP Co-Innovation Labs (COIL). The emIOT-A/iMX6 features up to four Classical CAN ports. The emIOT-X edge provides two Classical CAN interfaces. These products have been designed for industrial production environments. “The IoT gateways underline our long-standing expertise in the field of IIoT (Industrial Internet of Things) solutions,” said Michael Rennerich, Executive Director at Janz Tec. “Sensor technology is becoming ever more important in today’s production environments, so a company’s success ultimately depends on being able to transfer and analyze the data it gathers. Our gateways cover the requirements encountered in modern production environments in full, enabling our customers to get off to great start on their journey towards digitalization. As a medium-sized company, we are particularly proud that Janz Tec AG is now one of only a few companies worldwide with SAP Cloud Platform certification, joining renowned providers such as Dell, Hewlett Packard and Samsung,” added Rennerich. The two gateways are equipped with mobile communication (GPRS, UMTS, LTE) or low-power wide-area network technologies (narrowband IoT) to ensure optimum data transmission. Low maintenance and energy efficient, the systems also come with integrated WiFi and Bluetooth interfaces. In decentralized infrastructures, the GPS module enables determination of the position using GPS. Based on ARM processor architecture, the emIOT-A/iMX6 gateway is the choice when it comes to ensuring low energy consumption and covering a broader range of operating temperatures. The emIOT-X gateway, which is based on the Intel Atom processor, is equipped with additional serial as well as discrete inputs and outputs. Both products ensure that the sensor data obtained is transferred to the SAP Cloud quickly for data enrichment, further processing, and improving existing processes.